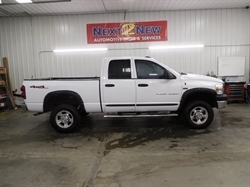 This clean 2006 GMC Seirra 1500 crew cab has a roomy cab, a powerful and efficient 5.3L motor, and innovative features. The alloy wheels, topper, nerf bars, and tow package are some nice additions to the truck as well. It comes nicely equipped with fog lights, rear defrost, trailer hitch, bench seating, trailer hitch, rear bench seat, am/fm stereo, CD player, air conditioning, cloth interior, cruise control, intermittent wipers, leather wrapped steering wheel, power driver seat, power locks, power mirrors, power windows, remote keyless entry, tilt steering wheel, heated mirrors, trip computer, airbag-driver, airbag-passenger, front disc brakes, vehicle anti-theft, nerf bars, tachometer, trip odometer, tow hooks, 12V power outlet, center storage armrest, floormats, steering wheel audio controls, steering wheel cruise controls, vanity mirrors, 4WD, full size spare tire, off road package, power steering, and tow package. Stop in today to drive your next new truck and to speak to one of ur sales professionals!! We have extended service contracts and financing available. Hello, I would like more information about the 2006 GMC Sierra 1500, stock# jeremy. Hello, I would like to see more pictures of the 2006 GMC Sierra 1500, stock# jeremy.